Nobody knows for certain exact age of The Angel Inn. Photographs taken prior to alterations carried out in the 1950's show that it was formerly a long rambling thatched building and although now greatly altered in external appearance, much of this original structure has been retained. The thickness of its walls, the tiny windows, wide fireplaces and ‘Flemish’ chimney suggests that it is indeed of some antiquity, and local tradition has it that it was originally built to house pilgrims making the journey to St David’s shrine. 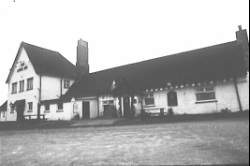 It has also been suggested that the name of the hostelry derives from the nearby monastic Grange of St. Michael at Llanmihangel Farm. In 1769 the house seems to have been known as Ty’n Maudlam, and the earliest reference to it under its present name occurs in 1818 when an alehouse licence was issued to a David Yorwerth “at the signe of the Angell”. Its earliest known licensee however was Hopkin Thomas (died 1743) who in 1730 was prosecuted for selling ale during the time of church services, and again the following year for selling it in short measure! Another former licensee who found himself in trouble with the law was Evan Evans who was prosecuted at Bridgend Magistrates’ Court in 1868 for selling ale on a Sunday, having been convicted of an identical offence two years earlier. On this occasion he offered as his defense that since the inn lay within the Borough of Kenfig, the Bridgend Court had no jurisdiction over it! His ingenious theory seems to have caused the bench a certain amount of amusement, but since Evans was unable to offer any evidence to substantiate his claim, he was duly convicted and fined.